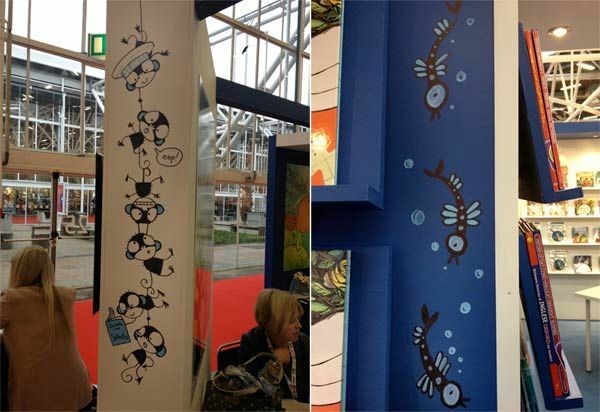 seawigs hits bologna children's book fair! Philip and I had no idea how the OUP stand would look, and we were super-excited when we saw the huge poster they'd made for us. Hurrah! 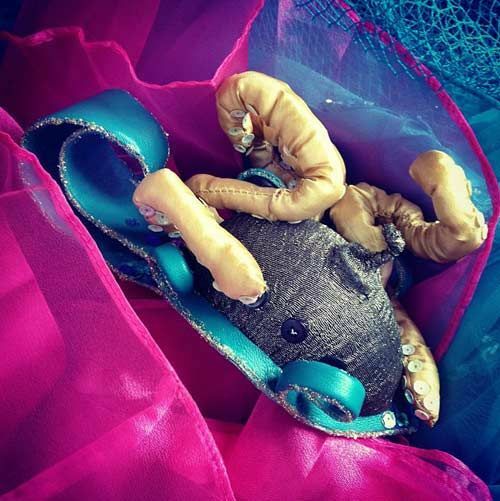 I got to wear this tentacularly fabulous hat created by Emma Toft of Studio 7t7. (You can follow her on Twitter at @studio7t7.) 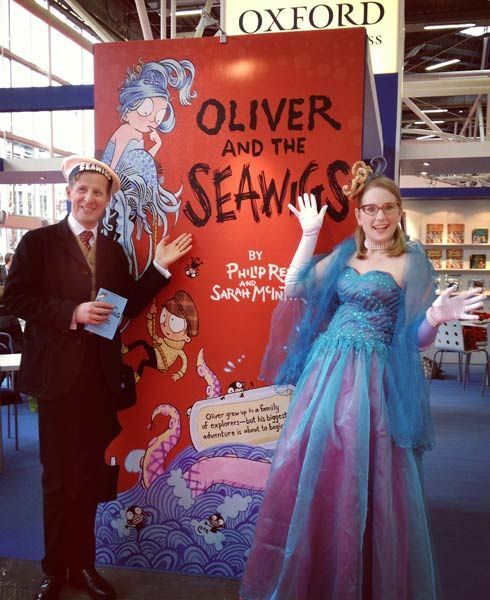 There's a submarine in Oliver and the Seawigs and one on the hat, too! Head of publicity Elaine McQuade gave black and blue pens to Philip and me and told us we could draw on any available surface. 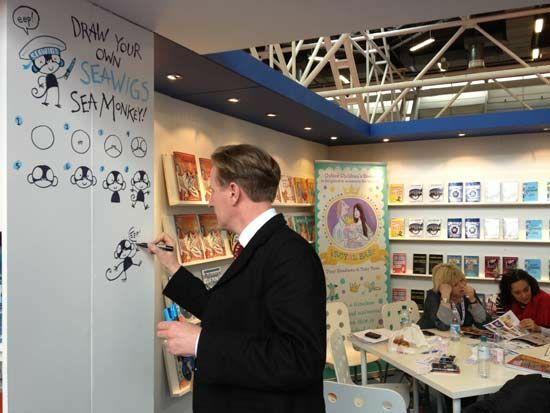 We almost got carried away and started drawing on the neighbour stand, too, ha ha. LOTS of sea monkeys. 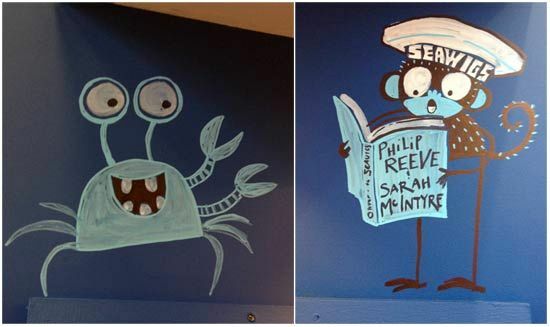 Inside the stand, we made a Draw-Your-Own-SEAWIGS-Sea-Monkey wall! 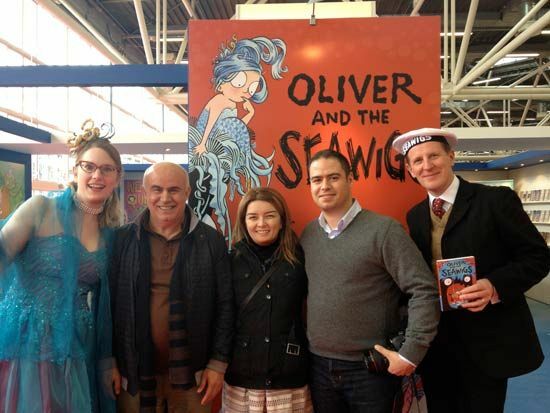 These Turkish publishers were so excited about Oliver and the Seawigs that they signed their contract with Giuseppe on the spot! 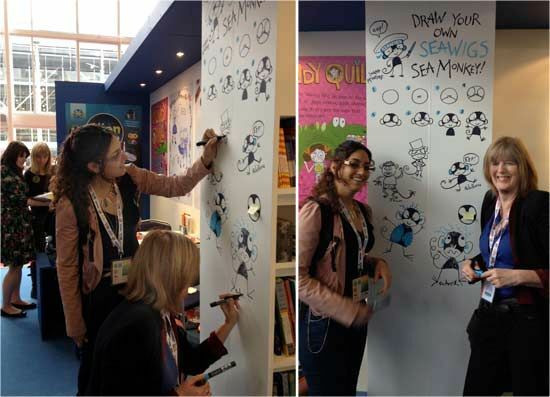 And Rights Manager Valentina Fazio clinched Seawigs deals just before the fair with German publisher Dressler and a Japanese publisher. So I have no idea what's happened since then, but it's so exciting to know that we'll get to see Seawigs in Japanese, German and Turkish! 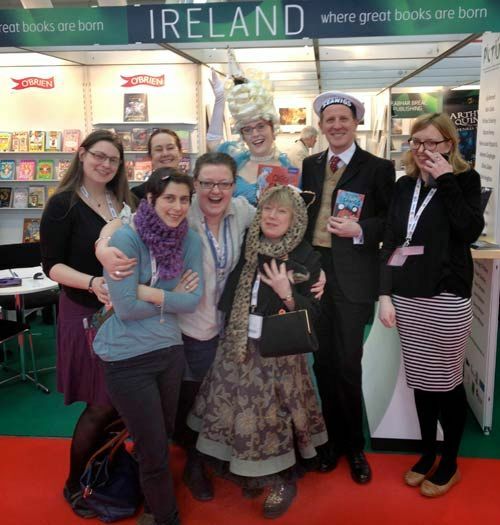 The every-exuberant gang from Children's Book Ireland were roving the fair and shot this video interview of Philip and me, which you can watch on their blog here! 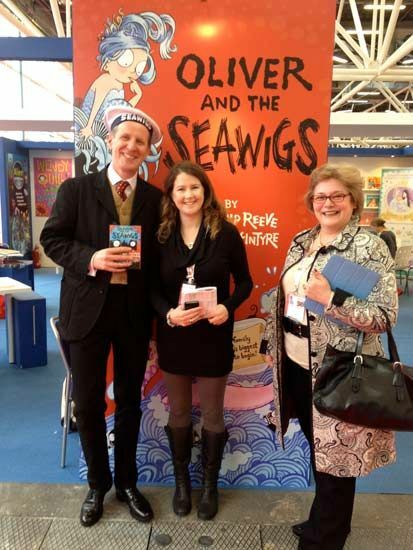 And here's Ireland's Children's Laureate na nÓg Niamh Sharkey with Philip and fab English writer Lucy Coats. The Irish CBI team really were out in force! As soon as we could, Philip and I made a beeline for their booth. Here's Patricia Kennon, Juliette Saumande, Nessa O’Mahony (is that right, guys? 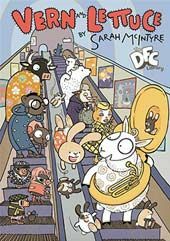 ), Jenny Murray, - oh look, it's writer/illustrator Babette Cole stopping by! 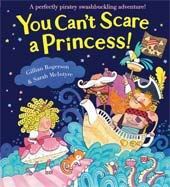 - and Mags Walsh. 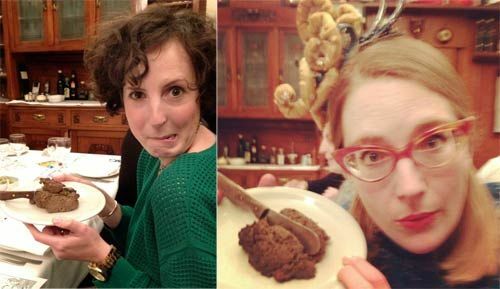 They're keeping a brilliant ongoing blog about the Bologna Book Fair on their Inis magazine Tumblr site here, do have a look! 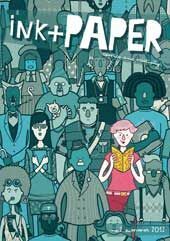 I'm super-excited for May, when I'm going to be joining these fine folk for the CBI Annual Conference and a week of mad drawing events with Niamh Sharkey and French illustrator Hervé Tullet (who was also in Bologna but somehow I managed to miss seeing him, argh!) 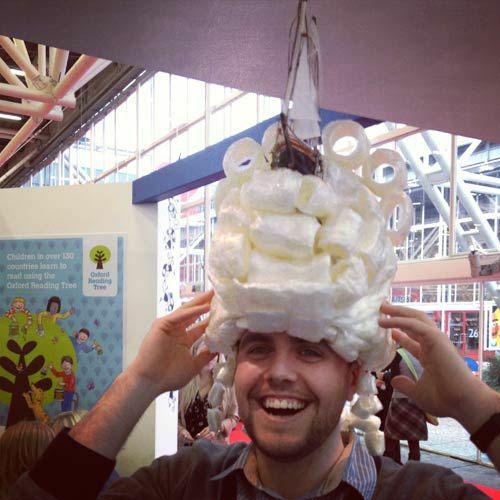 Here's a fine exhibition they had at their booth! I'm looking here at an illustration by Chris Judge. 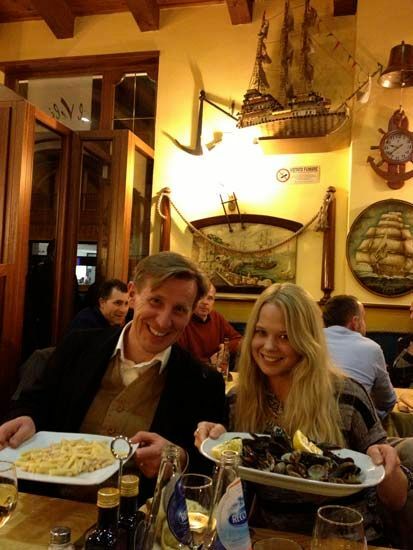 Bologna and good food really go together, and we had two fine meals out! 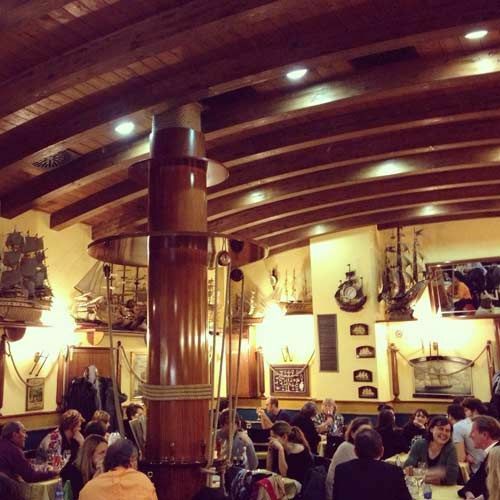 On Sunday night, when only some people of the OUP crew had arrived, we ate in a ship-themed restaurant called Il Veliero. 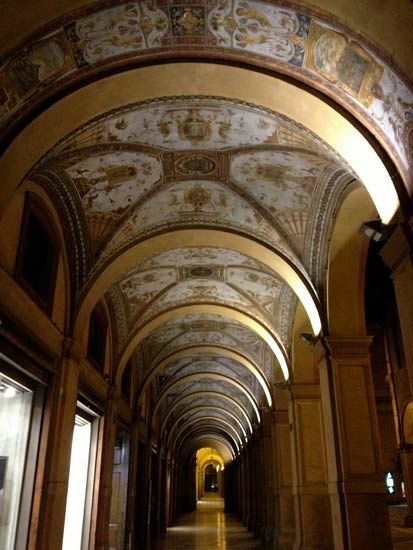 Look at that great ceiling! 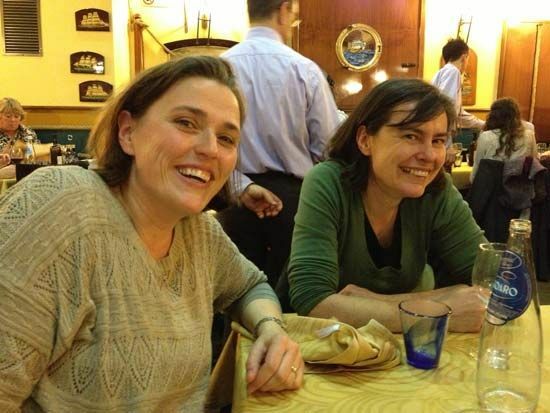 We had such a good laugh with Rights Manager Anne-Marie Hansen and our Seawigs head editor Liz Cross. I'm guessing they're probably cross-eyed from meetings by now, heh heh. 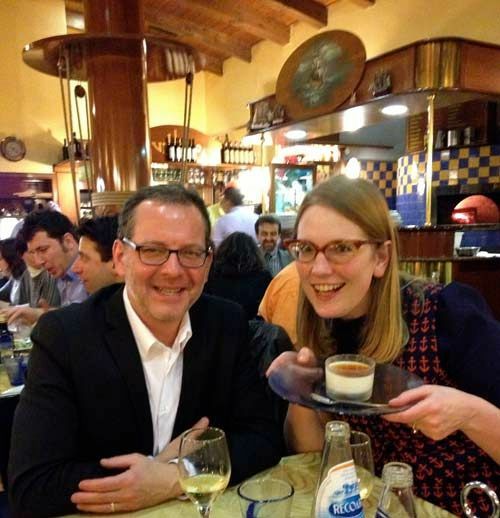 Here I am, showing off my panna cotta to American editorial manager of Sourcebooks, Steve Geck. We were so stuffed full of food that we decided to wander back home on foot, even though it was raining a bit. 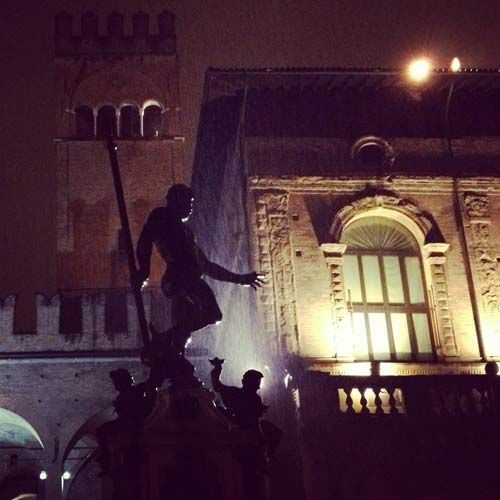 But the rain was pretty, it made the pavement glow and gave bright highlights to the statues. 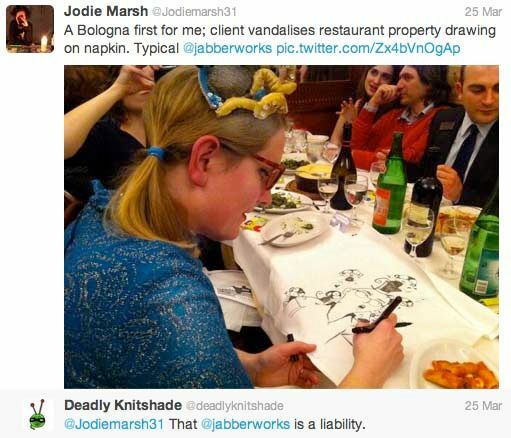 No, it was not what it looked like; it was, in fact, delicious OLIVE TAPANADE. 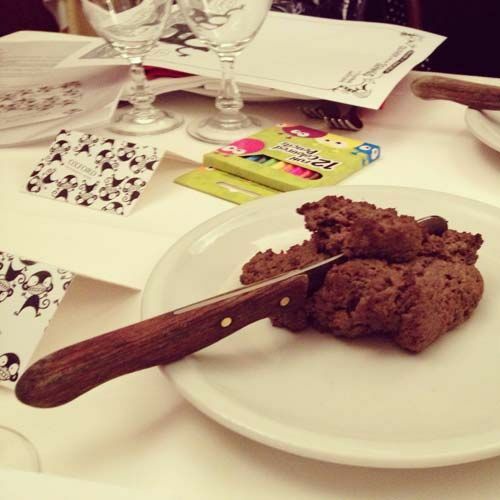 Oh my word, we had about 30 amazing courses at that dinner, including about 14 desserts. Here's Kobo's Lindsey Mooney (remember her as a publicist from DFC days, comics friends?) 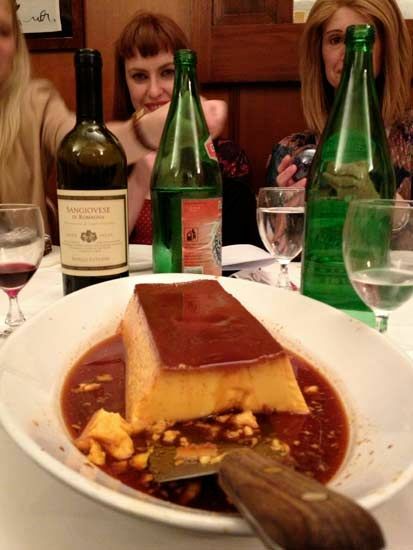 and OUP's Lou Brown looking across a giant panna cotta. 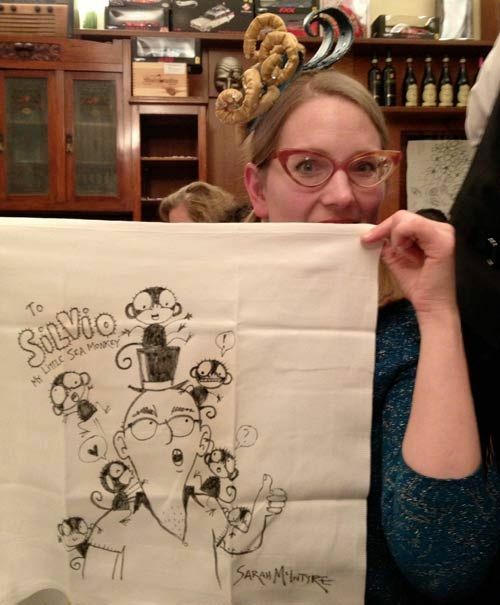 ...Just to clarify, Giuseppe's good friends with the restaurant owner, Silvio, and he TOLD me I could draw on the napkin! 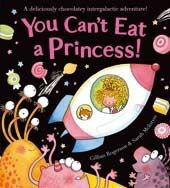 (At least, that's my story and I'm sticking to it!) Here's the man himself, in drawn form. I hope someone will tweet me a photo of us having a big smooch when Giuseppe presented it to him. 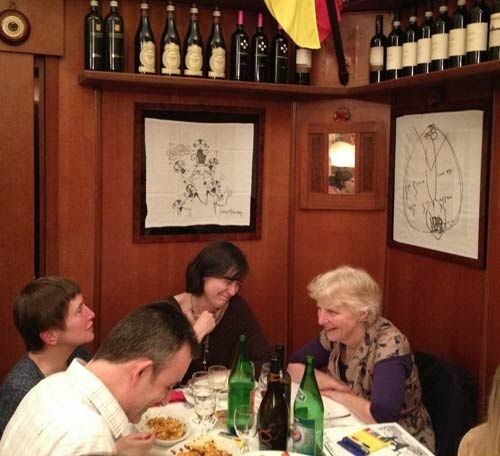 Silvio liked the picture so much that he immediately framed it and hung it on the wall! Here is hangs over Liz Scott, Philip's agent Philippa Milnes-Smith, OUP Director Rod Theodorou and The Guardian's Julia Eccleshare. 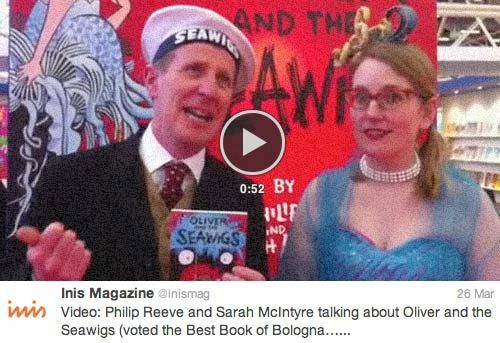 When OUP were first pitching for Oliver and the Seawigs, they made a funny video for us with a team of sea monkeys and Liz wearing her own seawig! 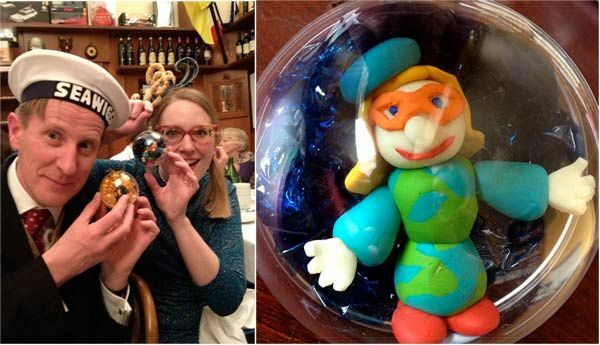 It had these baubles hanging in it (just like the ones that hold Mr & Mrs Crisp prisoner in the book), and at the dinner, we were presented with our baubles. I didn't manage to get a close-up of Philip's, but here's mine. So cute! Here's our fabulous Elaine McQuade, who did loads of the preparations for the book fair. I wish I'd caught a photo of her doing a wild sea monkey attack pose, that is one of the tragedies of my life that it was not captured on film. 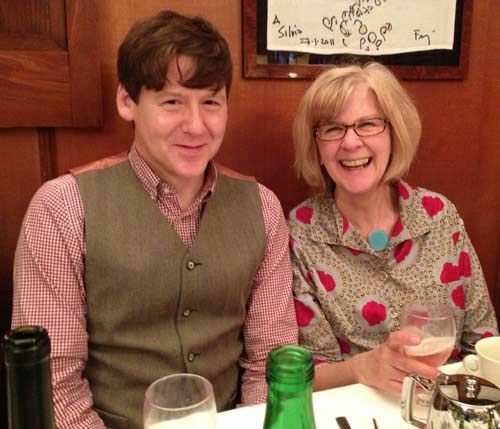 And she's here with Tom Tivnan, features editor of The Bookseller! I'm always reading his name at the tops of articles, so it was great to put a face to a name. Tom's originally from Boston, but he's lived practically everywhere and has an accent even more messed up than mine is. 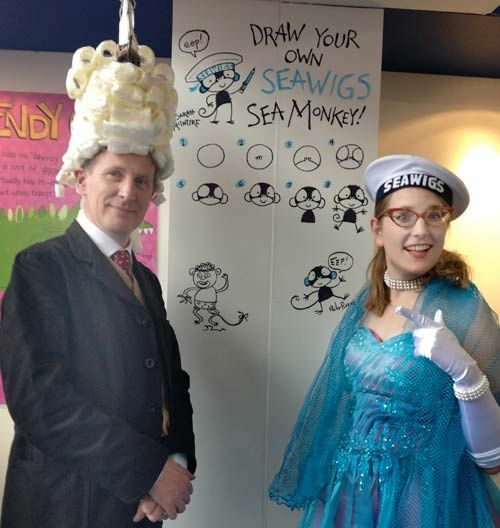 I'm going to do another Bologna blog post - hopefully tomorrow - about some of the other marvelous things I saw at the festival, but here are a few more of the Seawig drawings at the OUP stand by Philip and me. 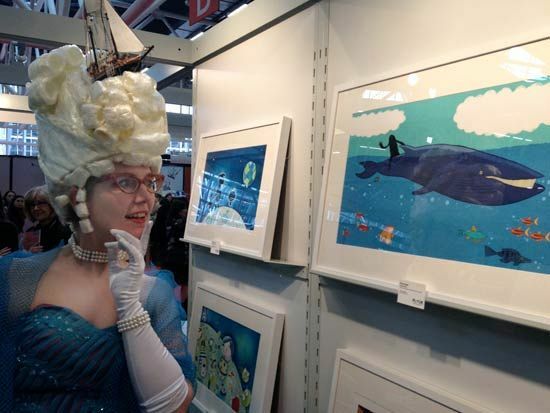 If you go to the stand and look carefully, you can spot a ship drawn by Babette Cole, and I'm hoping lots more will be added during the next couple days. 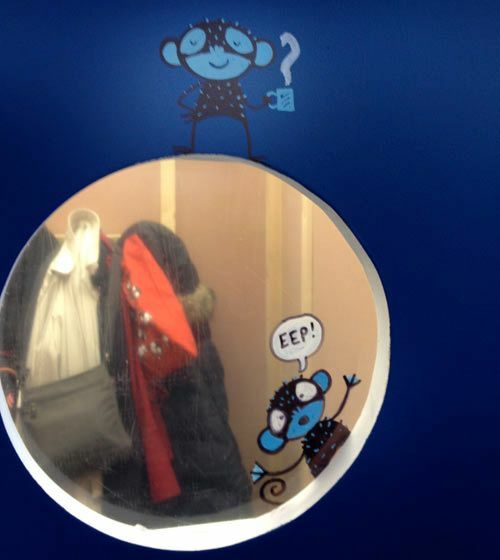 Ha ha, Philip even decorated the porthole to the Secret Cupboard. 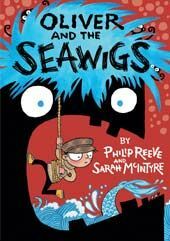 If you're on Twitter, you can follow us at @OUPChildrens, @PhilipReeve1, @LizJCross and me, @jabberworks. 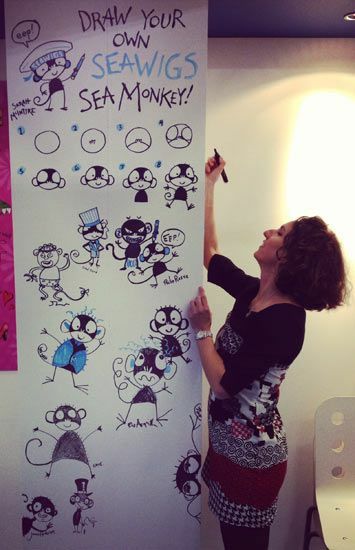 Here's Rights Manager Valentina Fazio leaving her mark! 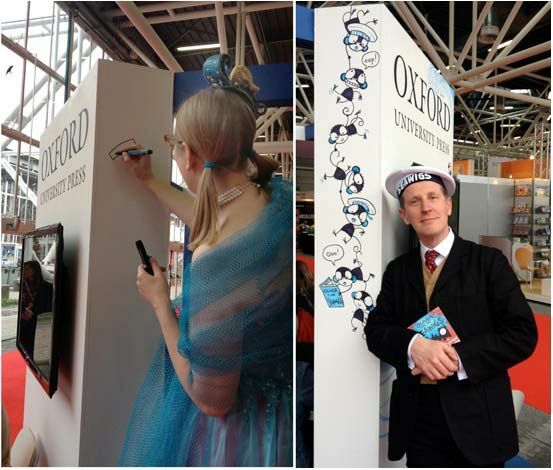 I had a total blast and I think the OUP stand was one of the most lively and fun at the whole fair. 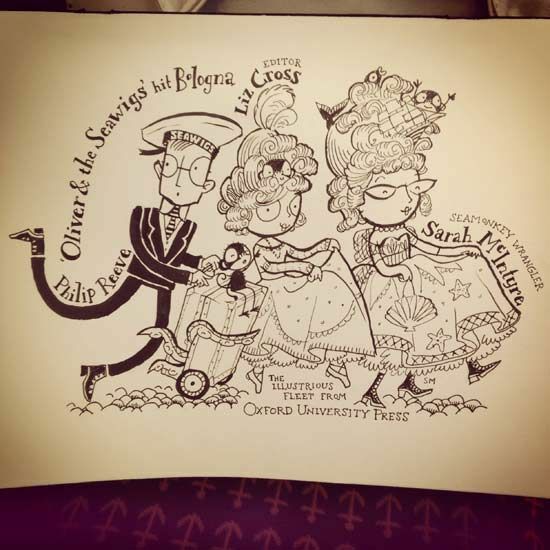 Thank you, OUP crew, for a marvellous visit! 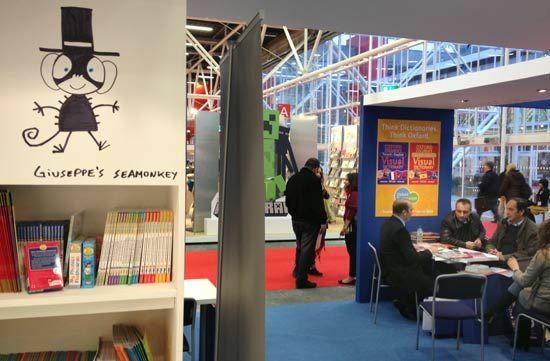 And thank you to our new German, Japanesee, Turkish and Bulgarian publishers! 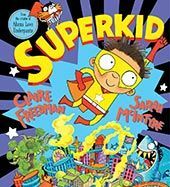 You can read more about the book fair over on the OUP Children's Blog! That's a fabulous drawin', and done on a plane too -- I can never draw anything on planes, unless it's sketches of my hands gripping the armrests tightly. Ha hah! Only spotted the extra foot on second look just now! Been greatly enjoying this! I see the Bologna fair from a very different angle because I help support the systems that the rights people use back in the office! Very interesting to see the front side of it, as it were. Yay, thanks! Meant to reply earlier! 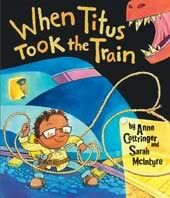 Really hoping to keep Little A's name in the book; there was a bit of talk because the spelling's not totally phonetic (more problematic if it appears in the title apparently), but fingers crossed!